Soggy socks are the worst. We are talking about sticky maple syrup on hands or hangnail-level type of annoyance. If a 50 percent chance of precipitation day comes along, you may decide to stay off of two wheels or you may risk riding. 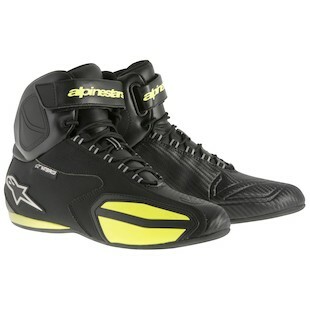 The Alpinestars Faster WP Shoes will make sure your risk will not translate into having wet socks. The waterproof membrane rounds out the Faster line, which already includes a regular and vented version. The Alpinestars Faster WP Shoes provide casual style, basic protection, and a waterproof membrane not found in the regular and vented versions. The men's version comes in black/gray and black/fluorescent yellow. With these shoes chances of rain do not have to dissuade you from hopping on your motorcycle. Also, you have the option of matching his and hers sneakers, if you're that type of couple. Not everyone wants track-style levels of protection for short rides, and the Faster WP shoes provide casual looks with a step up in protection from regular shoes. 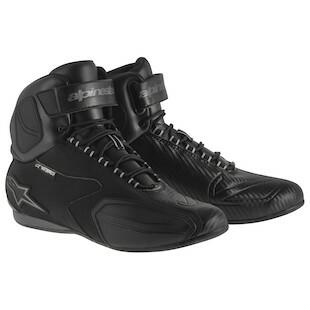 The Alpinestars Stella Faster WP version is designed specifically for women and only comes in black. These lightweight shoes are comfortable to wear off the bike and provide more protection than regular fashion sneakers. Slip on the Faster WP shoes if you are looking for casual protection, but want the functionality of a waterproof membrane. If full race boots don't fit under your skinny jeans, the Alpinestars Faster WP shoes will provide that extra protection that you are looking for without giving up the casual look. Waterproofing built right into the shoe makes the boots functional in addition to fashionable.